The National Archeology Museum (MAN) is like a chest of assorted treasures that lays out the evolution of the Iberian peninsula from prehistoric times to almost the present, revealing all kinds of anecdotes and curiosities along the way. The museum has been undergoing renovation work for the past six years. Now it is finally complete, and a week before its scheduled reopening, the press was allowed in to get a preview of the new facilities. Visitors who start filing in on April 1 will learn that the Neanderthals had a predominant gene for red hair and that being illiterate in Ancient Rome made life particularly difficult: the laws were hung outside public buildings and not being able to read them was no excuse for infringing them. The museum displays an original Roman tablet dating from this time. 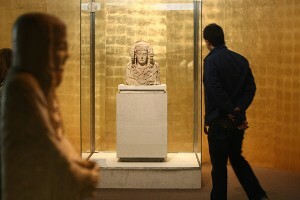 The new and improved MAN took 65 million euros to create, representing a budget overrun of €10 million. The project also went a year over the expected completion deadline. On the morning of the press visit, a few employees were still adding the last stickers to some of the display windows. The center has reduced the amount of items on display from 15,000 to 13,000, and improved their distribution. Featured elements such as the famous Iberian sculpture Lady of Elche stand out among more everyday artifacts, reproductions of prehistoric hominids and lots of audiovisual material. Each of MAN’s six modules features a four-minute video introduction that seems surprisingly modern for an archeology museum. The remodeling work has also extended to the gift shop and cafeteria, and added an auditorium, an activity room, a conference room, a hall for temporary exhibitions and improved access for disabled people. “We have brought a 19th-century institution straight into the 21st,” said Andrés Carretero, MAN director, at the press conference. “This is a new museum, and the best imaginable journey through the history of Spain,” added Culture Minister José Ignacio Wert, who was visiting MAN for the first time since he took office in late 2011.